I first got to know her playing from records of Mozart’s C minor piano concerto, K. 491. I scraped an introduction to her through a friend of mine . . . I had my first lessons in her Bulstrode Street flat whose main room had as principal ornament an Epstein Virgin and Child. She was then engaged in recording the Fauré Ballade and Françaix Concertino. I knew before I went to her of her reputation as a player of Mozart, Schumann and French music. At a time when a few only of Mozart’s piano concertos were performed, Kathleen Long was pioneering others, and made the first recordings of four of them: K.414, 449, 450 and 503. The B flat, K. 450 . . . shows the qualities that distinguish her playing: immense feeling, controlled by the style of the music, great variety of tone-colour, clarity of thought. She is one of the few English pianists who has played regularly with two famous French ensembles – the Loewenguth Quartet, and the Pasquier Trio. She was one of the first pianists to broadcast she played at many National Gallery concerts during the war (one a few hours after being bombed out of her Kensington flat, wearing a borrowed dress). She has played at the Carnegie Hall, New York, also in Canada and South Africa. She says that the greatest musical pleasure of her life was the group of concerts she gave with the ‘cellist Casals – his last appearance in this country in 1946. In her teaching she insists on a good tone – good fingers . . . she persuades you to a wide repertory and is delighted to help with modem pieces, since she has always made a point of playing new music herself. She will coach you admirably in chamber music (or accompaniment, which is really the same thing), for she is a wonderful chamber music player . . . not by any means reticent or retiring, but always listening, aware, alive. These characteristics of hers are fused with a vitality which belies the health worries that have been her lot, ultimately causing her retirement from College, and which she shrugs off with the most amazing good humour. Getting to know her has meant coming to love her dearly, for she is as great a person as she is a performer. Kathleen Long should have been the solo pianist on Friday, and many were looking forward with pleasurable anticipation to this return visit to her native town. She is, however, undertaking an important tour abroad at the request of a Government Department . . . her place being taken by the Russian pianist Nina Milkina. Home from her tour overseas, she took part in chamber music at the Aeolian Hall on Saturday as a member of the English Ensemble – an admirable group of musicians (according to The Times critic) – who played piano quartets, Mozart in E flat and Brahms, Op. 60 and the Schubert ‘Trout’ quintet. . . He notes that the pianist is the life and soul of the Ensemble, and in the Mozart sets an example in crisp, clear phrasing, which in some instances might have been more fully followed by the string players. The playing of the Brahms Scherzo was outstanding and was a performance which reminded one of the great days of chamber music performance in London. As she recounted it to the Daily Telegraph, her ‘tour’ involved travelling by sea in a war-time convoy to Reykjavik for several recitals and broadcasts. Finding the Icelandic people very friendly, she had also met Pall Isolfsson, a local organist who had taught (until the Nazi regime intervened) at the Thomas-Schule in Leipzig in the 1930s. Miss Long found his playing of Bach notable for magnificent rhythm, absolute precision and clarity.
. . . the Feoffment School Hall being filled with a most appreciative audience to hear a programme extending over an hour which covered a range of at least a dozen composers . . . although she was a little tired in view of the fact that this was her eighth concert in ten days! She confirmed comments made to us showing that the war has brought a revival of interest in classical music everywhere . . . We were especially pleased to find César Franck’s Prelude, Choral and Fugue in her repertoire at Bury – in a brilliant performance which gained for her an ovation, and was followed by the presentation of a lovely spray of flowers by Miss Wormald.
. . . whose voice was a bit too strong for the Feoffment Hall. It was thrilling to see the Athenaeum packed . . . for the Music Lovers’ Concert given by the Boyd Neel Orchestra and Kathleen Long. The outstanding work undoubtedly was Mozart’s Piano Concerto No. 14 in E flat. The opening is full of life and high spirits, and was given with freshness and spontaneity which thrilled. Mozart’s slow movements contain some of the finest gems of the musical art, and the second movement here is one of his most beautiful. The last movement is quite original in form. Kathleen Long naturally had a great reception, and at the conclusion of a brilliant rendering, the pianist, orchestra and conductor had a deserved ovation. In the second part of the programme, the pianist again appeared, this time more in the part of the continuo rather than as soloist, the work chosen being the Concerto Grosso by Bloch, the Geneva-born American-naturalised composer (b.1880) whose music is so distinctly Jewish. The movements include Prelude, Dirge, a charming Pastorale and fugue, leading to a brilliant Finale. The work was well presented and revealed the capacity of the orchestra and pianist for really vigorous playing, as well as for the more subdued work which was demanded during the evening.
. . . given by the distinguished pianist, Kathleen Long. The large and appreciative audience listened entranced to a well-balanced programme ranging from the classical works of Bach and Scarlatti to works by modern French composers. The faultless technique of this great artist was admirably displayed in the beautiful rendering of the Bach Partita in B flat and in a group of Sonatas by Scarlatti. The principal work was the B minor Sonata of Chopin. Here she was at her best . . . the lovely tone of the melodic passages and the vigour of the bravura left the audience in no doubt as to her mastery of the instrument. To mark the Schubert 150th Anniversary in 1947, she joined two soloists (soprano, Margaret Ritchie and clarinettist, Frederick Thurston) to perform The Shepherd on the Rock at the University Music School in Downing Place, Cambridge. In the 1950s, the French Academy were the first to honour her as an internationally known artist. They made her an Honorary Member of the Acadámie de France, presenting her with the Palmes d’Or for her services to French music. This was in recognition of her war-time music broadcasts from the BBC in London, and also those from European continental radio stations during the post-war period. In 1954 the Royal College of Music awarded her an Honorary FRCM to mark more than 30 years on their teaching staff. In the 1957 Birthday Honours she was awarded the CBE for her services to music. In the early 1960s her health and eyesight deteriorated and she began to consider moving to Bury, eventually retiring to Whiting Street (near enough for lunch at the Masons’ Arms, as she admitted to her many local friends). At the AGM of the Club in 1965 she played a crucial role in her capacity as President, by agreeing to take the Chair. This meeting involved both the Club’s change of name and also its move to a new venue – the Theatre Royal, about which she nevertheless expressed her reservations. In May 1965, Kathleen Long gave a concert at Ickworth in aid of research into polio and other crippling diseases. Moving her piano into the Rotunda, she played a programme of works by Bach, Scarlatti, Chopin, Schumann, Debussy and Fauré. ‘My concert at Ickworth will be an informal one and I shall be playing as if I was in my own studio.’ Her Steinway piano was the one used by Rachmaninoff for his London concerts. Having been in her London house since the bombing of 1940, it was now in her home in Whiting Street. Many local music-lovers still recall hearing her practising as they walked past, others remember the after-concert parties she used to hold while living there. In May 1966 she gave a recital in St Mary’s Church in aid of the NSPCC. She opened with Beethoven’s ‘Tempest’ Sonata Op. 31, No. 2, followed by four Scarlatti sonatas, some Chopin items, and Ravel’s Ondine (from Gaspard de la nuit). Following an interval she played the Prokofiev Sonata in one movement, and ended with a Schubert Laendler. ‘This is the artist giving herself a very short encore and, it is hoped, sending the audience away in peace,’ the programme noted. She had told an interviewer in 1950 that Ondine had been taught her by the composer himself, ‘a dried up little man’ to whom she was introduced one afternoon by the novelist Arnold Bennett, an erstwhile London neighbour with whom she used to enjoy playing duets. On 4 December 1967 her Theatre Royal invitation recital was broadcast by the BBC; this proved to be her last – she died at Cambridge Station on 20 March 1968. In the late 1980s, it was pointed out to the then Chairman and Secretary of the Bury Concert Club that her grave was by now indistinguishable. They circulated an appeal in 1990 to members of the Club and others whom they knew among her friends and professional colleagues, and commissioned a memorial to be cut, which the Club continues to insure up to the present day. 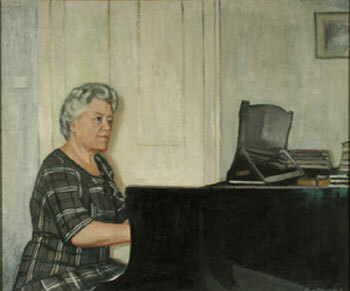 The image of Kathleen Long is from a painting by Guy Worsdell (1908-1978) which is owned by the Royal Academy of Music. Every effort has been made to contact the copyright holders to seek permission to use this image.